As a well-known but often overlooked fact, some procaryotes are able to unite into surprisingly complex structures, considering their primitive organisation on the cellular level. 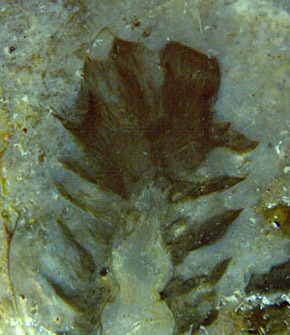 Impressive examples are provided by the more or less dense tufts of this filamentous blue-green alga or cyanobacterium  occasionally seen fossilized in the Rhynie chert. Microbes hitherto undescribed may have been involved in the formation of horizontal microbial layers also found in the same sample. The below pictures are to complement those in . Also they are shown here for the beauty of the various aspects of Croftalania venusta. Figs.1,2: Croftalania venusta grown as separate tufts of filaments without a solid substrate. Width of Fig.1: 11mm. Fig.3: Croftalania grown on shrivelled Horneophyton. Width of the picture 10mm. It is not obvious why the tufts in Figs.1,2 are connected by what seems to be a wobbly dark line on the cut face, possibly the boundary of some weakly solidified or gel-like substrate. Croftalania grows also on solid substrates (Figs.3-6), here partially decayed Horneophyton (which is easily mistaken for Nothia) lying in water. It tends to grow upwards, towards the light. There are unexplained differences in the aspect which can be characterized in a funny way by comparison with human hair: natural and fluffy (Figs.1,2) or styled into spectacular and pointed shapes by means of some sticky substance (Figs.3-6). Figs.4,5: Pointed tufts of Croftalania with clear outline, resembling leaves or scales on a cone. Width of the pictures 5.5mm, 4.3mm. As some of the pointed tips are seen to consist of converging filaments, the idea suggests itself that they had been formed by capillary force like the tip of a wet painter's brush. However, for this to happen the habitat would have to temporarily fall dry, which most probably would have irreversibly collapsed the delicate structures seen here. Fig.6: Cyanobacterial coating (Croftalania) on Horneophyton but not on Castracollis moult fragment. Width of the picture 4.5mm. Another feature requires an explanation: Distinct boundaries of the filamentous tufts are more often present (Figs.3-6) than absent (Figs.1,2). They look as if the tufts had been carefully trimmed with smooth cuts regardless of the orientation of the filaments. Even plane faces as in Fig.6 above right had been formed in this way. Note also the Castracollis moult section. As none of the numerous moult fragments in this chert sample is coated with cyanobacteria, the little crustacean must have lived and moulted in the water when the growth of Croftalania was over. Hence, some time had been elapsed between the growth of Croftalania and the silicification of the flooded habitat, during which the tufts could have been trimmed by means unknown, or possibly even by crustaceans like Castracollis and Ebullitiocaris, smoothly nibbling off the organic gel with filaments enclosed. 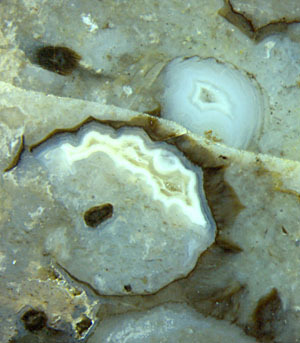 Fig.7: Microbial layers, originally horizontal, largely deformed into a trough, and agate indicating the absence of any further deformation while it was being formed. Width of the picture 4.5mm. Stacks of more than a dozen horizontal layers up to several centimeters in length, some of which are seen in Fig.7, have been observed near Croftalania. They resemble the continuous layers of doubtless microbial origin in numerous other samples of Rhynie chert. In some places in the present sample they are traversed by thin filaments which may be Croftalania, as discussed in , where also a possible involvement of other microbes is mentioned. Air bubbles are often seen trapped between the layers or having penetrated them when ascending. The layers are always more or less deformed without a discernable cause, as in the case of Fig.7, where 4 or 5 layers are cut off, obviously in connection with the enigmatic formation of a trough filled with dark debris and a water-filled cavity above, later turned into agate. 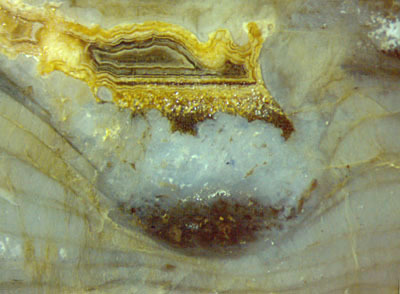 While the numerous layers of the banded agate were deposited there were no more deformations, as can be concluded from the perfectly straight bottom line. It must be admitted that more questions than anwers are provided by the above images of fossil cyanobacteria, which all have been taken from one sample of Rhynie chert found in 2001. Croftalania is one of the very few fossil cyanobacteria species  not confined to stromatolites. 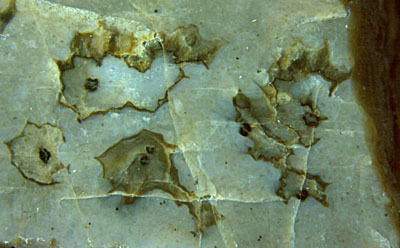 Silicification of free water in the Devonian habitat of Rhynie had enabled the leaf-like formations of Croftalania, which anticipated the forms of eukaryotes to come, to be preserved as life-like fossils. 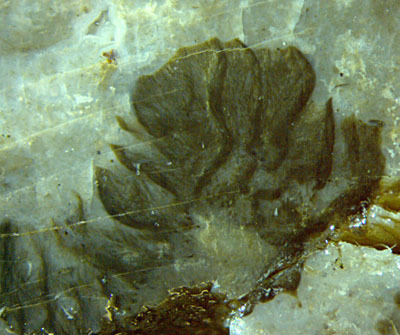 A filamentous cyanobacterium showing structured colonial growth from the Early Devonian Rhynie chert. Rev. Palaeobot. Palyn. 146(2007), 265-276. T.N. Taylor, E.L. Taylor, M. Krings: Paleobotany, Elsevier 2009, 115-117.